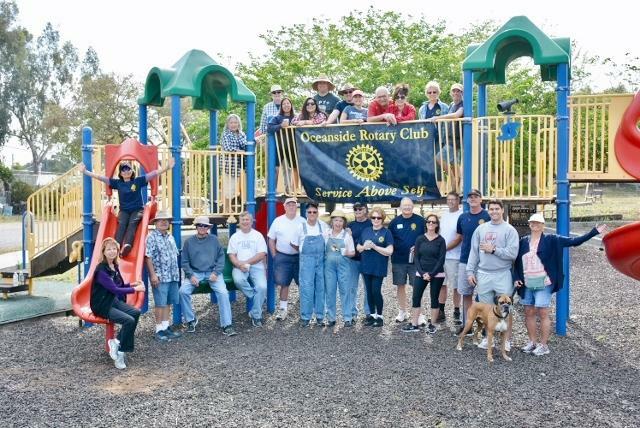 Rotarians at Work Day was held on Saturday, April 28, 2018 at Ivey Ranch in Oceanside. Over 30 members and friends of the Rotary Club of Oceanside gathered for a morning of Community Service. At the conclusion of painting the fences on the property a tree was planted in honor of the day and a BBQ meal was served. Ivey Ranch is dedicated to encourage the interaction of those of all ages, with and without disabilities, by providing educational and recreational activities. Since 1983 they have served children and adults with disabilities but will not exclude the able bodied, since interaction, inclusion and interaction are important components of their program. They serve over 200 individuals a month. Rotarians at Work Day is held on the last Saturday of April world wide. The concept was conceived from District 5340 the district which our club falls in. Each club chooses a specific project in the community and the club members participate though work and fundraising. For more information call Renee at 760-518-5076.